April 30, 2018 - Dubai, UAE: The holistic events agency, Plan b achieves the Guinness World Records title for creating the Most People In A Photo Cut-out Board Picture which was unveiled and showcased at the Middle East Special Event and Exhibition 2018: Awards(MESE) that puts a spotlight and sets it centre-stage in the Events and Exhibition industry. 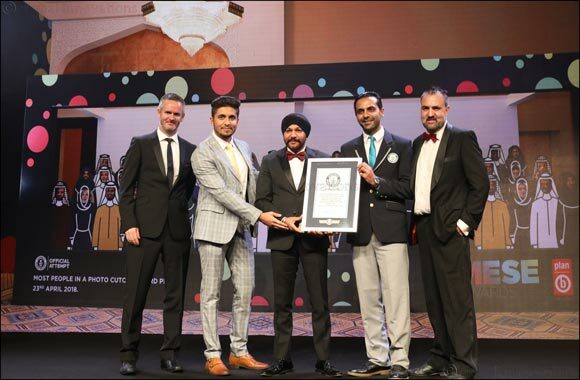 The Guinness World Records certificate was presented to Harmeek Singh, Chairman and Founder of Plan b by Samer Khallouf, The Head of Records Management in MENA - Guinness World Records (GWR) on Monday, 23rd April 2018, in the presence of leading conglomerates of the events industry at the annual MESE Awards held at Madinat Jumeirah, Dubai. Plan b, the eight-entity strong group of companies specialized in events, advertising, strategic and experiential marketing, achieved the unique feat of creating a Cut-Out Picture Board for 50 people. The Cut-Out Picture Board is 10x3x3.2 metres. It is made up of 300 kg of wood and this was built by six workers in 10 hours. Expressing happiness at the achievement, Harmeek Singh said, ‘‘The frame signifies togetherness and team spirit which is symbolic of everyone from the events industry fitting into one frame. Entering the Guinness World Records places Plan b on a global platform and strengthens our position as a global player.